This article explain the sp_MSforeachtable procedure in SQL server. All versions of SQL Server have undocumented Stored Procedures or functions. This may be because those Stored Procedures or functions are used by Microsoft internally. This type of Stored Procedure or function (undocumented) can be any without any notification. 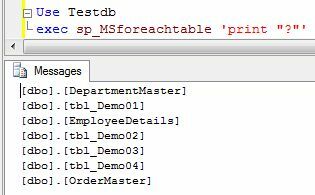 The "sp_MSforeachtable" Stored Procedure comes with SQL Server, but it is not documented in MSDN. This Stored Procedure could be found in the Master database. The Stored Procedure "sp_MSforeachtable" allows us to easily process some code against each and every table in a single database. It means that it is used to process a single T-SQL command or number of various T-SQL commands against every table in the database. @command1 It is the first command to be executed by this Stored Procedure and the data type is nvarchar(2000). @replacechar It is a character in the command string that needs to be replaced with the table name being processed. The default value of this parameter is a "?". @command2 @command2 and @command3 are two additional commands that can be run for each table. Here first Command1 is executing then command2 and then command3 will execute. @whereand This parameter could be used to provide additional constraints to the command for helping to identify the rows in the sysobjects table that will be selected. Its data type is nvarchar(2000). @precommand This command is to be run before processing any table. Its data type is nvarchar(2000). @postcommand This command is to be run after the processing of all the tables. Its data type is nvarchar(2000). The following script helps us to list all the tables of the "TestDb" database. Another example. The following script helps us to determine the space used and allocated for every table in the database. This stored produce may be used for the following purposes. These undocumented Stored Procedures can be used if we want to do the same operation on each table of any database. Please note that Microsoft may change the functionality and definition of this Stored Procedure at any time.